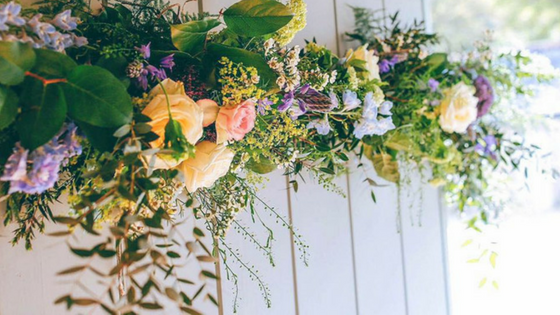 Twigs and Greens is a specialist florist designing floral arrangements for weddings in west Cornwall and beyond. Owner Jen Simpson has been working in the floral industry for nearly a decade, with a wide range of experience covering weddings and events in Cornwall and the Midlands. Her style and ethos is natural, rustic and beautiful, while being elegantly subtle. I was honoured when Jen agreed to meet with me and talk through her floral designs and approach. She is someone who really cares about her flowers and how they work together. 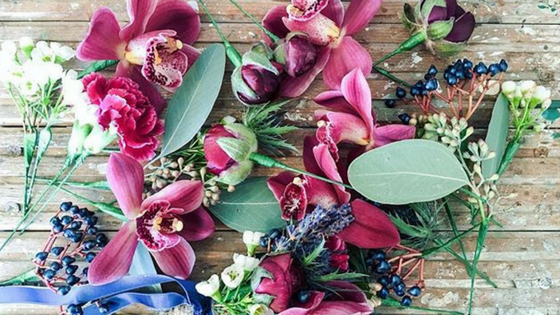 How and when did you get started in the floral industry? I trained in floristry nearly ten years ago whilst working at a lovely garden centre and florists in Leicestershire, where I grew up. I left thinking that a “grown-up job” meant computers and offices, and so pursued a career in marketing and events. Upon moving to Cornwall in 2010, I realised that working in front of a screen was no longer for me. I worked in a couple of local florists, covering all aspects of floral design; weddings, funerals and events, and after a few years, decided to go back to school. I retrained at Rosewarne College in Camborne and qualified with a City and Guilds Level 3 Diploma in Floristry in 2014. One year later, I decided to go off on my own and open my own business specialising in wedding flowers. 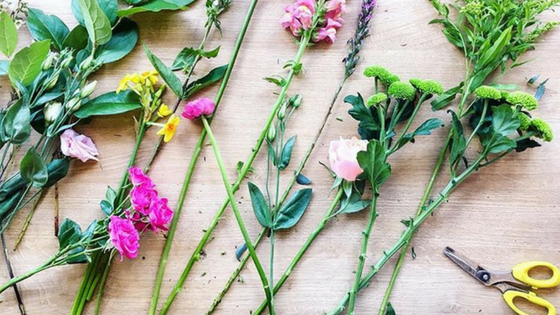 What attracted you to floristry? My first job when I left school ignited my flame for floristry. Working in the garden centre, learning about floral arrangements and displays, I fell in love with the natural, rustic beauty of flowers. Although I did venture off and dabbled a bit in marketing, I had found my true calling and wanted to work with flowers, designing beautiful and unique arrangements. There is something so satisfying about creating a beautiful display which is organic in both shape and colour. My style is botanical with a nod towards flamboyant, loosely gathered with twine, hessian, lace or ribbon. I am constantly inspired by beautiful images I see on Pinterest and Instagram. Gorgeous images of weddings on social media are so inspiring and available at your fingertips. I do like to also flick through wedding and interior magazines to source ideas. There is something about cutting out images and sticking them into a scrapbook which I just love. One of my favourite spots I like to take a walk along is St George’s Memorial Walk in Hayle. The walk is lined with colourful flowers and botanical plants bursting with life. It’s a good spot for reflecting and finding inspiration. Of course, living in Cornwall is also inspiring, with dramatic coastlines and rugged hilltops. What is your favourite flower and why? I have so many favourite flowers, I couldn’t possibly tell you my absolute favourite. From dried flower pods and botanical leaves to timeless garden roses, peonies, delphiniums and anemones, there are so many beautiful flowers. What are the main floral trends for interiors? For summer, it’s all about bringing colour into your interiors. I am certainly noticing a trend for ombre colours, having flowers in one colour and different shades. Blue is especially popular because of its connotations with summer skies and beautiful blue waters. There is a steer as well towards more rustic, earthy tones like burgundy and red. This colour trend is set to be huge for 2019 interiors. Blush pink and pretty peaches will continue to feature in interiors, as these colours lend themselves to timeless colour schemes. 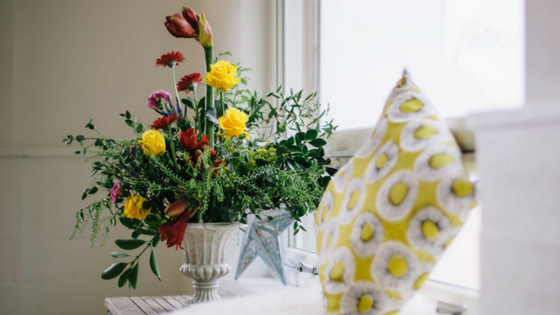 Do you have fresh flowers at home and how do they relate to your interior design scheme? Working from home means that my interiors are always filled with beautiful flowers, freshly cut ready to create a bridal bouquet, floral crown, or botanical displays.